Well here I am in Rockhampton. Where it’s colder than it was in Cairns. I’m about to enjoy a winter activist experience. There is plenty of water through Shoalwater Bay (the exercise area this year is restricted because of it). I enjoyed the road trip down, and I’ve enjoyed a quiet settling-in process at my new place in Park Avenue (the seedy end). I’ll be posting a page about organising issues. Today I’m lodging a couple of Peaceful Assembly notifications. Meanwhile a momento of the road trip to what I’m calling Franz Jaegerstaetter House. 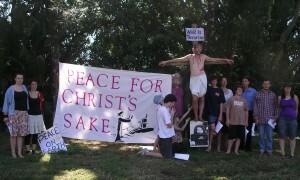 A place to experiment with nonviolent direct action in July 2011. I found plenty of meaning this Easter. I went to mass on Thursday, Friday and Saturday as we ritually remembered the arrest, execution, and resurrection of Jesus. I read the part of Pontius Pilate at the Good Friday Mass of perhaps 300 in our local church. Through the whole proceedings I had this parallel image of Jesus struggling for justice in Roman times, and our good selves struggling for Justice in USA times. It just seems so obvious to me that the church – “the body of Christ” is called upon now to renounce war, and to put itself on the side of nonviolent love, and yet it struggles with its calling. Bishop James (who read the part of Jesus in the passion) mentioned in two seperate homilies that in the 2011 calendar, Easter was as late in the year as it possibly could be, so that Easter Monday was also ANZAC Day. Then he fell silent and had no more to say about it. So I was happy to receive e-mails about two Catholic Worker actions on Good Friday. Jim Dowling (above) in Brisbane, and Ciaron O’Reilly (below) in London. On Easter Sunday in Australia, a network of faith groups started up an ANZAC Eve Peace vigil, using lanterns designed by Graeme Dunstan to commemorate ALL the victims of war as part of ceremonies. It was appropriate to launch the inaugural event on Easter Sunday. Here is a pictorial report on the event in Canberra. 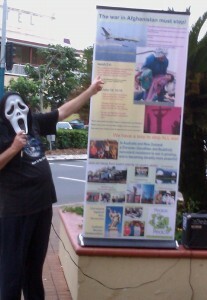 Here is a pictorial report on the event in Cairns. As I move towards a Ploughshares Action in Rockhampton in July, during exercise Talisman-Sabre, I found great meaning in the Easter/ANZAC Day conjunction, and I loved coming across the pictures of activists I’ve known and worked with (some for decades) hard at it – even during the present difficult times for peace activists around the world. Call me naive and optimistic, but it feels to me that we’re at a cusp, where every impetus towards nonviolence and unarmed love can tip the balance in our sad and sorry world. 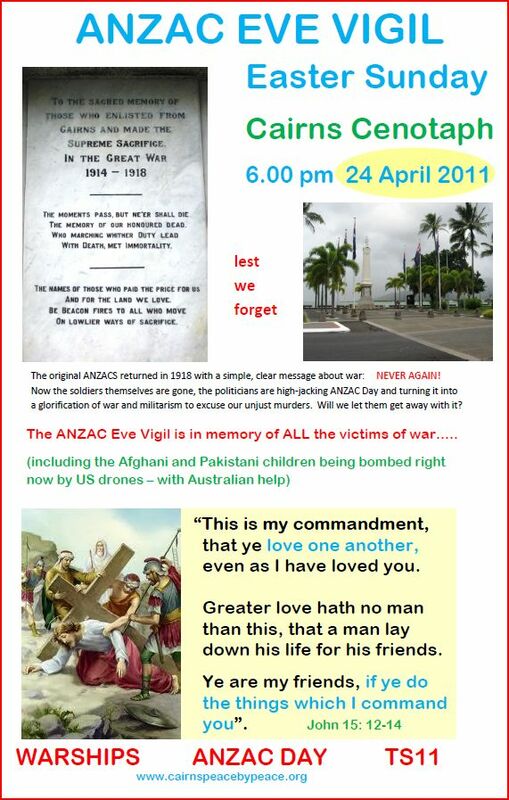 The inaugural Anzac Eve Peace Vigil is being held at the Cenotaph this Easter Sunday 24 April 2011. Bring chairs to sit on, and blankets. The ceremony will be inclusive, reverant, and offer plenty of opportunities for personal witness or remembrance. Then we move to thinking about peace, and how to use current circumstances to work effectively for peace. You can read an opinion column about the event that was published in the Cairns Post today. Follow this link for what’s happening in Canberra. Which one is the federal Agent? Hint: he's the only one NOT flashing the peace sign. A mixed bag of nibbles, nostalgia, and revolution. Read Bryan’s “Farewell to Cairns” here! This event is a shared fundraiser between Mike Moore of Cairns Blog (Councillor Alan Blake is suing him for defamation) and Bryan Law (towards the ploughshares action). Peace by Peace is organising an ANZAC Eve vigil for Easter Sunday. 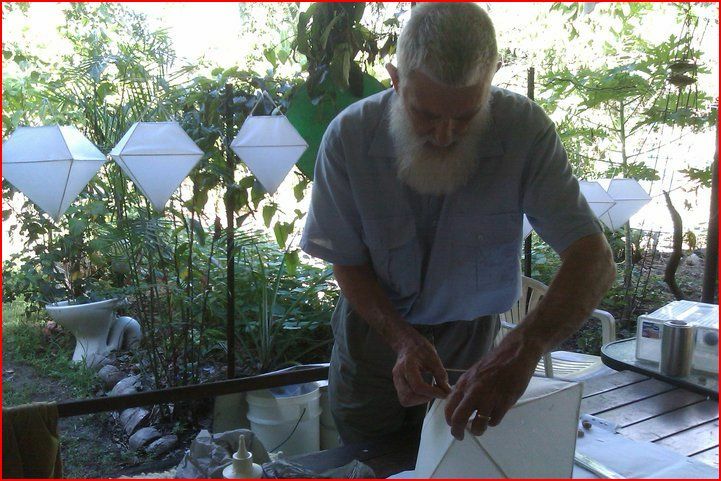 In conjunction with the australian Quaker Centre, and a peace crew in Canberra, the vigil is going to be lit with candle lanterns. 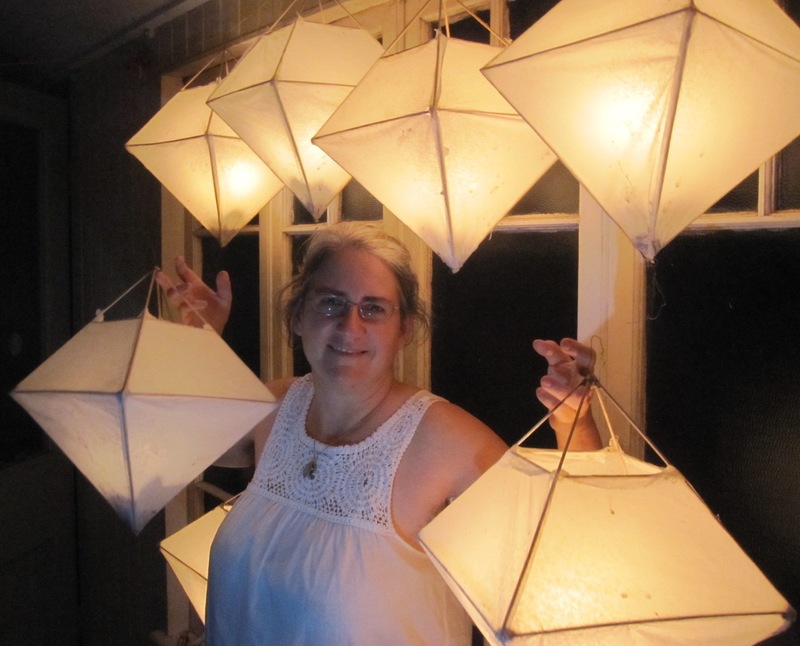 We’re having a get together at the Digger St Arts Collective on 26 and 27 March to repair some lanterns, and make some more. 105 – 107 Digger St North Cairns from 10.00 am. 26 March is also the day on which Earth Hour takes place, so the lanterns we have ready that day will be displayed at a community event in City Place that evening. Since Monday 7 March I’ve been doing 2 hour speaking and display gigs three times per week. At City Place, Cairns Central, and some other location in Cairns (last week was the University). The display banners work well. 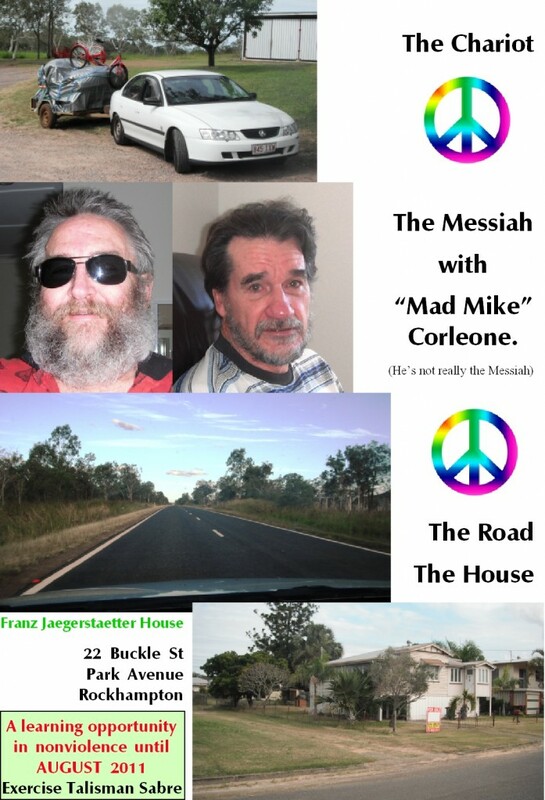 The central image is the one Jim Dowling showed to the Court during our Pine Gap trial. That page holds out a “Ploughshares solution” to permanent war. The other side promotes our ANZAC Day vigil, with a bit on TS11. It’s daunting to stand in a semi-sterile public place, and spruik about Afghanistan, Peace, and social justice. At the same time it’s very energising. There’s plenty of agreement in the community about war. Widespread cynicism and powerlessness. Some encouragement. Major avoidance. In each location, the spruiking and display attracts attention from a couple of hundred people each time. It’s good for me to notice both the patterns and the range of public response. 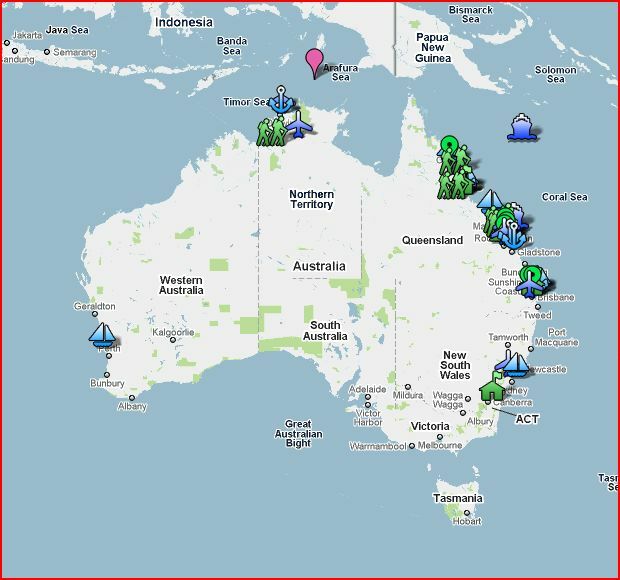 I see the mext 6 weeks as refining my display for deployment in Rockhampton when I move there at the beginning of May. Plus I get to dress up as Death and have fun. Author bryanPosted on March 17, 2011 Leave a comment on Speak Out! A VERY short Parliamentary program! 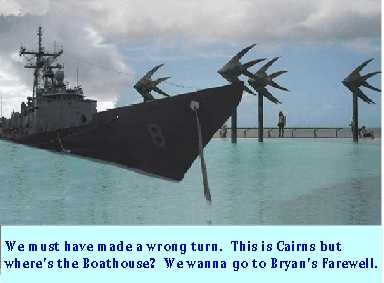 In my last post I encouraged folk to make submissions to a Parliamentary inquiry, and advocate some Peace Conversion measures – taking money away from arms acquisition, and putting it into disaster planning and relief, using the ADF in that role. I had thought (briefly) that this inquiry, and some ideas from Rob Oakeshott, might provide an opportunity for some discussion. Thanks to those who moved on the idea. Sadly the Parliamentary process was over very quickly (less than a week). The Committee held one public hearing in Canberra, the day before submissions closed. The numbers were assembled by the whips and wheeler dealers, and any ideas about peace conversion were quietly killed. The Greens supported the government’s legislation re the Flood Levy, and this appears to be part of the Greens/government negotiations that led to a Carbon Tax also being introduced into the Parliament this week. As a person excluded from Green Party politics, I’m not entirely sure this was a good move from the Greens, but I’m happy to watch for future developments. Meanwhile I’m happy to have written a submission that sets out my thinking on the contrast between arms spending and human safety. That submission is published here. I’m including it in my little propaganda stall. Author bryanPosted on March 3, 2011 Leave a comment on A VERY short Parliamentary program! Right now in Canberra the House Standing Committee on Economics is conducting an inquiry into the Flood Levy Bills, from the Prime Minister, seeking to raise $1.8 Billion towards a $5.6 Billion Commonwealth expense for infrastructure reconstruction. The independents and Greens have used their numbers in the House, voting with the Liberal National Party, to force the Flood Levy Bills to an inquiry. The prevailing sentiment among them is that reconstruction can be funded through savings found in the budget. 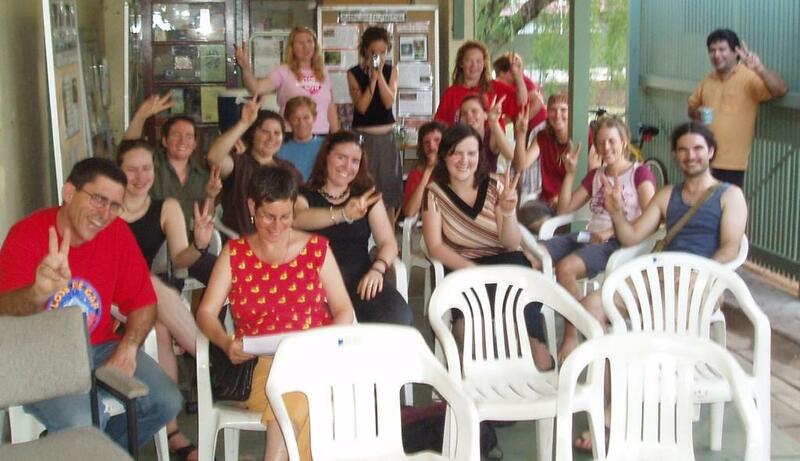 Several groups within the Australian Peace Movement have responded to this opportunity – to support disarmament and peace conversion – and are thinking about how to do this effectively. While tying it in to the other initiatives we have under way. The Australian Anti Bases Campaign Coalition are using the inquiry to call for the cancellation of exercise TS11. You can read the submission I made at the page to your right. Each icon represents an opportunity for action to hinder, obstruct, or publicise the TS11 imperial war games. Click on the image to go to the Google Map itself for more detail. Visit the Peace Convergence Website for some ideas about actions and coordination. Our plan is to encourage a mixture of autonomous small group action, medium scale support action across the country, and one or two “mass” actions close to Shoalwater Bay. We also encourage the range of social and cultural activities that work towards a peaceful world. The Peace Convergence site is one organising tool, and is meant to provide information and the basis for coordination between groups across the spectrum – and to provide leadership for the convergence. We call for all actions to be nonviolent and respectful. Every activist and contributer is encouraged to take responsibility for their own actions. As a people we commemorate the courage and sacrifice of our soldiers in WW1. Those soldiers who returned spoke movingly about the horror and futility of war. Against the hopes and dreams of the ANZAC veterans, Australia is now in a state of perpetual war. The war in Afghanistan is against tribal peoples on the other side of the Earth. We have never been attacked or hurt by these people, yet we are using all our technology and skills to bomb and kill them. Why? We are at war because of our military alliance with the USA. We hope this alliance will protect us from “enemies” who might emerge and threaten us in future. No other nation on the planet threatens us now. Are we cowards? There can be no military victory over terrorism. Indeed war inflicts terror, and escalates a political problem into crisis. Terrorism is criminal behaviour, and the best response is effective policing. 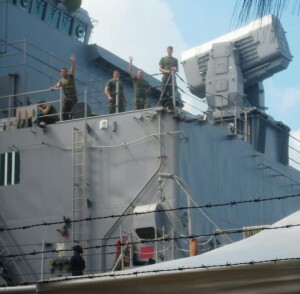 Indonesian and Australian police brought justice to the Bali bombers. Military action in Afghanistan has only made matters worse. 2011 will see the 10th anniversary of this futile, brutal war. Our politicians use occasions like ANZAC Day to hide behind the valour of our soldiers. Those who speechify from the podium talk about the sacrifice of soldiers without ever explaining why we’re at war, why it’s failing, or how we’re going to end it. Politicians do not go to war. They send others. Jesus commanded us to “love one another”, to love our enemies, and to sacrifice ourselves rather than to kill. Christ died for us in the most painful and humiliating way so that we might be forgiven our sins and go on to the Kingdom of God. The RSL (a political organisation) has perverted the message of Christ, and misused John 15:13 to suggest that any soldier who dies in war is following the commandment of Jesus. 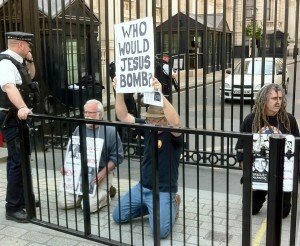 Would Jesus bomb the children of Afghanistan or Pakistan? Would Jesus take up arms against anyone? 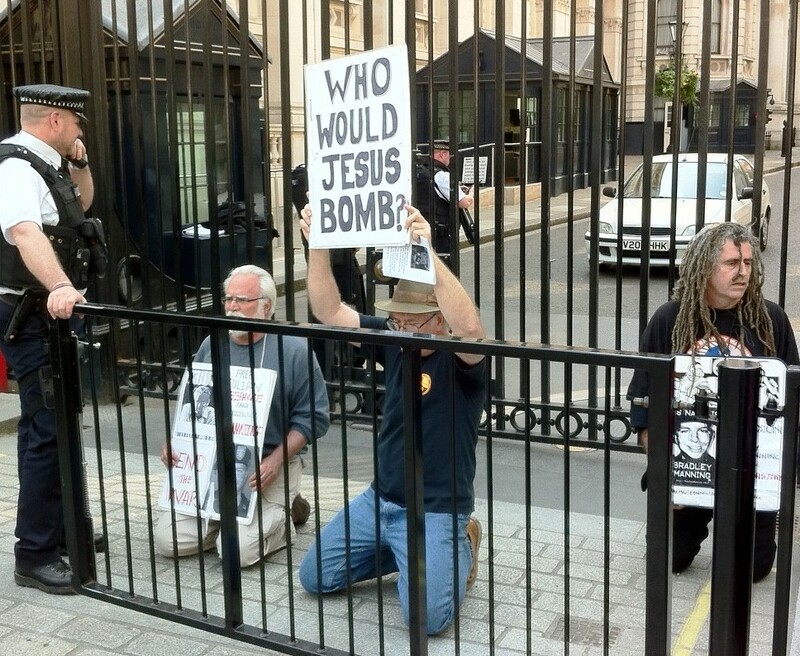 Or would Jesus manifest the love of God for all people through a nonviolent struggle for peace and justice?